Current discussions about work often refer to the role of the artist. In this regard, the art world seems to serve as an exceptional sphere inside the larger neoliberal system that functions as both a screen for the worst nightmares of capitalist exploitation (in the west) as well as a promised land where labor ceases to be merely sold life time, but becomes a fulfilling creative practice and as such a paradigm model for labor at the end of history: On the one hand the art world is often considered an experimental laboratory where the new spirit of capitalism is trained – the art world as a social set-up in which enthusiastic individuals allow themselves to be happily exploited, to participate in all kinds of productions for their excitement. On the other hand the art world is just as often conjured as the sphere in which the same individuals can experiment with different forms of emancipation and protest against the constraints of work under "normal" social conditions; that is, the ability to practice art production as a form of refusal of bureaucratic work. 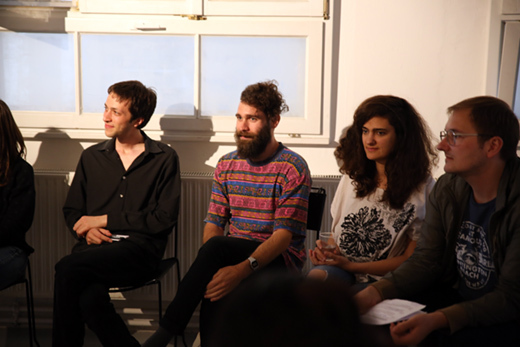 In discussion with Martin Beck and Philipp Kleinmichel and with respect to their own particular artistic and curatorial practices, Marwa Arsanios, Katharina Burin, Nestor Garcia Diaz, Robert M Ochshorn, and Alex Reynolds will investigate whether these assumptions are valid.